In my humble opinion, the biggest need of the Pens for this draft is to get some big, scoring wingers. In the last few years they have been forced to trade young players for quality wingers to skate with Crosby and Malkin. So when Carter Ashton was still on the board when the 29th pick came up, I was very hopeful, but then the Lightning trades some higher picks to get another first round and takes him out from under our noses. I was a little distraught because such a good pick was right there and then gone. But when Ray Shero stepped up to the podium to make the last pick of the first round and selected Simon Despres, a little smile made it's way across my face. The 6-foot-3, 210 pound defenceman fills another of the glaring holes in the Penguins system. Several of the d-men currently in Wilkes-Barre are ready to make the jump to the NHL and Despres will be there to take their place as the future of the Pittsburgh blue-line. From Saint John of the QMJHL (the Pens favorite place to draft from), this defensive defenceman would fit in well under Dan Bylsma. He is a great shot blocker and is still capable of playing at both ends of the ice. He is tough to beat head-to-head and is very smart positionally. Despres is a good puck handler with surprising mobility for his size. The biggest weakness of this 17 year old from Laval, Quebec, is his lack of physical play. As Simon develops over the next few years, he will have to learn to finish checks and use the body more. If this year's Stanley Cup playoffs were any indication, anyone who plays for the Pens will need to use the body often and effectively. 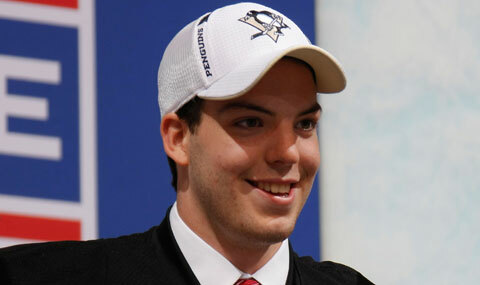 Overall, Simon Despres is a steal for the Penguins at pick #30. He was rated as the #8 North American skater by Central Scouting, the #12 overall prospect by the Hockey News, and the #18 overall prospect by TSN. He will need some time to develop into an NHL caliber defenceman, but this is a great pick for the Pens. Day 2 begins at 10 am on Saturday and the Penguins have one pick in round 2-7. The currently have the 61st, 63rd, 121st, 123rd, 181st, and 211th picks. Stay tuned to which mid to late round pick becomes the next Stanley Cup hero. I'm talking about you Max Talbot (234th pick in 2002). "He is a big hulking d-man who moves very well and has great size for a d-man. His play is sometimes inconsistent and his puck skills need some improvement. He will have to learn to play more physical. As opposed to using the body when absolutely necessary, he will have to consistently learn to finish checks and step up in the neutral zone." Scouting Report: An extraordinarily frustrating player. Possesses skating ability and size many would kill for, but plays with zero intensity. Could be a star rearguard if he puts it together. Notable Numbers: Lead Saint John in plus/minus; next-nearest blueliner was a plus-5. Years Away: 2, but will not make a significant impact offensively in 4+.